Fearlessly figuring out the tips, tricks and cheats to better quilting. Because I want it done yesterday. Well, I must say that I am overwhelmed by the positive response to my Print Party: Solids Soiree; thank you all for your lovely comments! GILL from the UK!!! Hooray!!! Thanks to everyone for commenting to win; keep your eye on the Robert Kaufman swatchandstitch.com blog for a chance to win the Great Big Giveaway concluding the Blog Hop. Good luck and keep hopping!! 30 Quilts for 30 Years OR Secret RK Kona Cotton Quilt Revealed! Now it's my turn to say I've worked on a Secret Project! Earlier this year, I had the honour of being asked to be one of thirty designers to help Robert Kaufman Fabrics celebrate the 30th Anniversary of Kona- their signature line of cotton solids! For me, a quilt designer who generally loves to work in print, print and more print, an all-solid Kona quilt was an interesting and welcome challenge. Prints can often do some of the work in giving a quilt a complex appearance that can belie relatively simple piecing. A well-placed large fussy cut of a bold geometric print can stand in for actual geometric piecing. 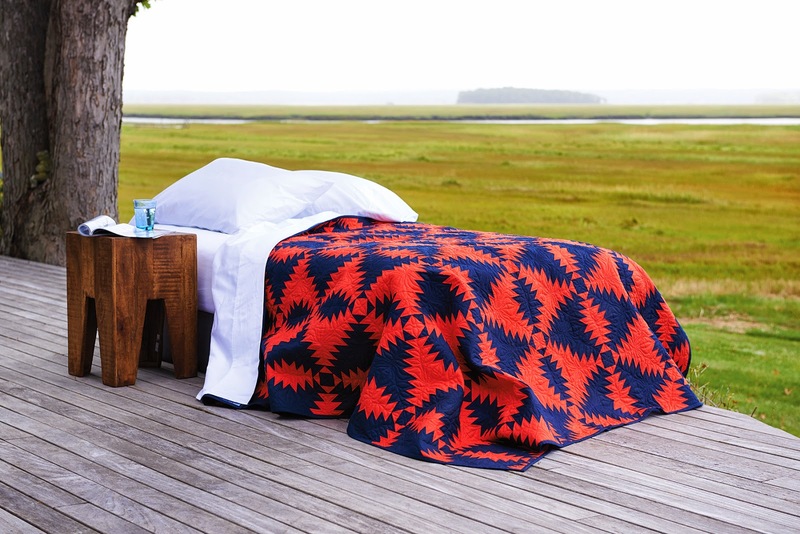 So, in an all-solid quilt design, there was no place to hide, and every seam counted. "Print Party" was originally designed as a quilt class project for students at my "home shop," The Workroom in Toronto. It is simply titled "Sampler 2," and is a next step for students wanting to build their skills with a more challenging quilt. For "Print Party: Solids Soiree," I made a number of design decisions that were a direct result of working in an all-solid palette. For example, my original version of this quilt includes filler blocks. 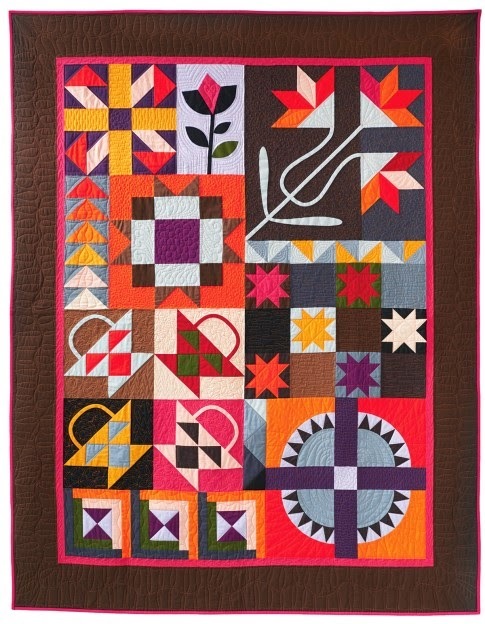 Since the quilt is composed of blocks of varying size, the filler blocks are used to fill in the areas between oddly sized blocks. Filling in these spaces with a swath of a single solid colour felt less interesting than creating a bit of additional pattern through the use of HSTs and Flying Geese units. I am particularly pleased with the section of six Flying Geese in a gradation of orange; gradients always make my eye happy. I also added more piecing in the background for the Carolina Lily block. Since it's really large (a 24" square), an expanse of a single, solid colour seemed to dominate that corner of the quilt too much. I divided the background subtly and worked it in a combination of brown and dark grey instead. After a particularly long and cruel winter, I was craving hot, bright, saturated colour. Pomegranate and Tangerine emerged as favourites. White and cream were avoided completely; my palest cottons were Shadow (a pale grey), Ice Peach and Thistle (a soft, dreamy violet). For balance (and because I love dark quilts), I used very dark neutrals (Black, Coffee, Charcoal, Espresso) as a counterpoint to all that vibrant colour. 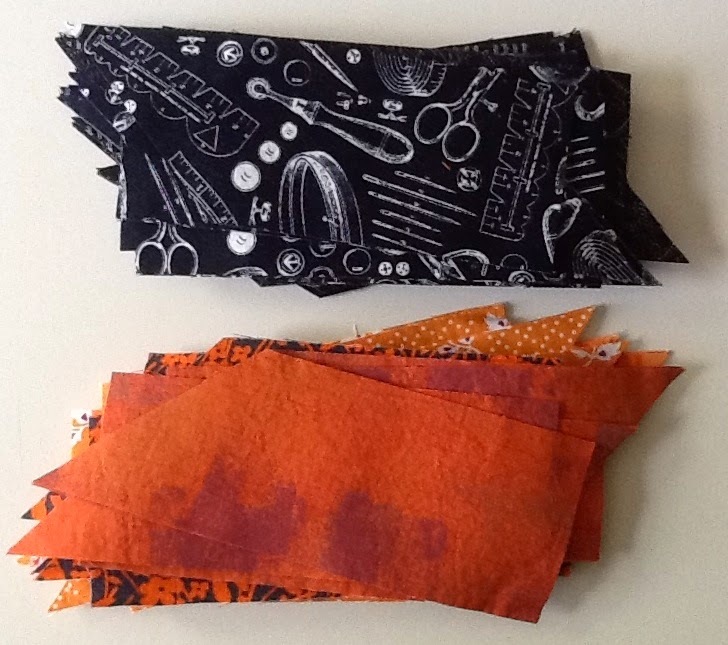 I passed my completed quilt top over to Michelle of Kallisti Quilts, who long-arm quilted with exuberant variety and texture in a rich, vivid orange. Enough about my quilt- let's talk about you entering to win a Giveaway! 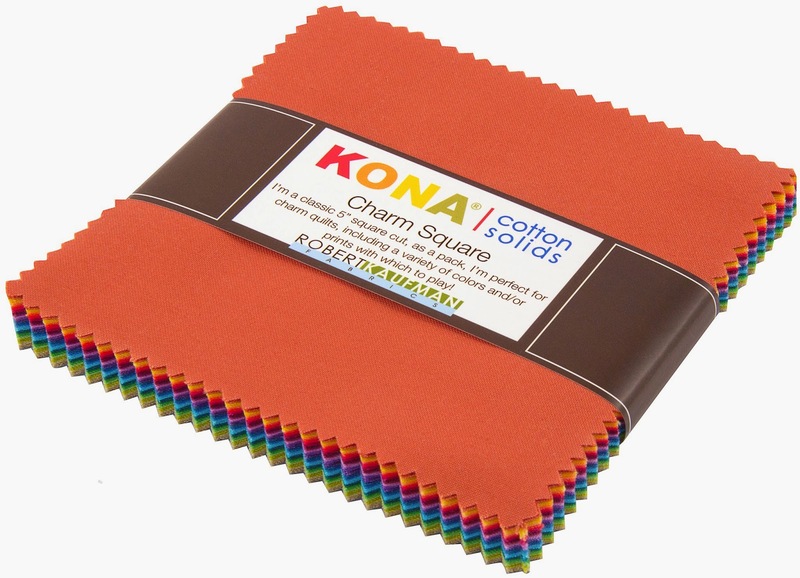 To celebrate Kona's 30th Anniversary, Robert Kaufman Fabrics is generously providing a Charm Square pack of Kona Cotton 2014 Colours! Yes! This pack includes two of my fave new colours: Watermelon and Pickle. Scrumptious! In addition to the Kona Charm Square pack, I will also be giving away a copy of my Print Party quilt pattern, which will include additional notes for the extra piecing I included in the Solids Soiree version. For a chance to win the giveaway for my blog, simply enter a comment for this post by midnight tomorrow night (November 2). I will count the number of entries and select a winner with the True Random Number Generator. Check back on this blog November 3 or 4 to see if you are the lucky winner, and we can organize getting your prize to you. (Be sure to comment in a way that I can identify you!) Good luck! Also, keep your eye on the Robert Kaufman quilting blog, swatchandstitch.com for details on their great big giveaway concluding the blog hop on December 3. Have fun hopping, good luck with the giveaways and Happy Quilting!! Funny things, those hexagon quilts. Since the patch is an odd shape, it is a challenge to figure out exactly (or even vaguely) how many hexagons of a given size would be needed to make a specific size of quilt. After a recent email asking just that question, I have decided to bite the bullet and figure it out for us all! My calculations and recommendations for yardage and "metre-age" are skewed toward the generous, so you might need fewer hexagons or a bit less fabric than what you see here. Better to be safe than sorry. Please take the fabric requirements at the end as estimates, not gospel. Ok! Now let's have a look at how many hexagons are used in a few common arrangements of Grandmother's Flower Garden (GFG). These quilts are typically composed of Flower Units (either a single round of petals around a centre or a double round of petals around a centre). These Flower Units are either set directly next to each other, or set with a single "path" of a background fabric between them, or a double "path" of background fabric. 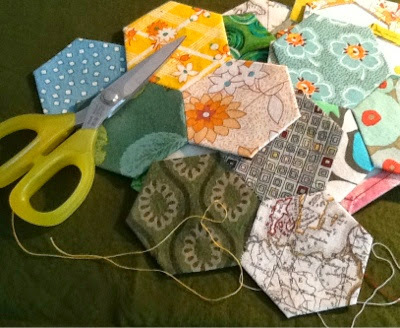 Say, you want to make a queen sized hexagon quilt. My Master Size Guide says that a queen quilt with a 12" drop (the quilt hangs over the bed on the sides and at the foot) is 84" x 92." For our planning purposes, let's round those numbers up to the nearest 10. We will plan for 90" x 100" for buying our fabric. A 90" x 100" quilt means 9 blocks x 10 blocks (remember, we are working with a 10" block). That makes a total of 90 blocks. Let's work with that 1" hexagon for now. 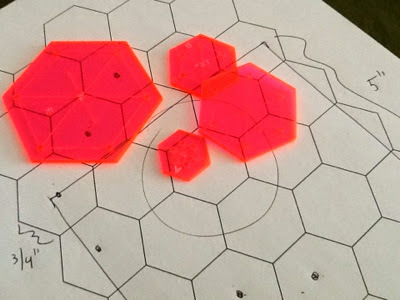 Depending on your design, you just need to divide the total number of hexagons (4,680) by the number of hexes in your Flower Unit, whichever one you decide to work with. Let's do Double round flowers with a single path between flowers. That type of unit requires 29 hexagons in total. 4,680 divided by 29 = 161.4 Flower Units. We'll say 162 units. To break it down further, each unit needs a centre (162 hexes in all), a first round of petals (6 x 162 = 972 hexes in all), a second round of petals (12 x 162 = 1,944) and background "path" fabric (10 x 162 = 1,620 background hexes in all). Most of time, folks are working "scrappy" for the Flowers, but these numbers will give you a rough idea of the total amount of fabric you will need to have on hand. The only fabric you might likely buy in quantity is the fabric for the centres (the same centre throughout the quilt can serve as a unifying element), and the background fabric. Our theoretical quilt needs 1,620 background hexagons. 1,620 divided by 224 (the number of 1" hexagons we can get out of a yard or metre) = 7.25 yds or m.
That is a lot of fabric. Better safe than sorry. On a side note, since the background requires so much fabric (lots of small shapes require a heck of a lot of seam allowance to get them together), I would guess that this is the reason that background "path" fabric in vintage GFG quilts is often white or natural muslin. These choices could be, and can still be, purchased in the large quantity required for a more reasonable cost than fancier prints or even coloured solids. In tidying up my sewing room (which is a never ending endeavour), I came across several envelopes of pieces that I had pre-cut some time ago. These had been intended for a quilt design that I was very keen on... at the time. Now, I'm not. They have officially become Scraps. This is the very reason why I rarely ever do a massive pre-cut before I start to work. It's my own, private Murphy's Law: A complete, total pre-cut will ultimately result in an abandoned, unfinished quilt. I lose steam in all that preparatory activity, and I become my own buzz kill. So, "cut a little, sew a little" is the way forward for me. What works for you? A big, pre-cutting session, or a "little by little" approach? Let me know what you think! True story! 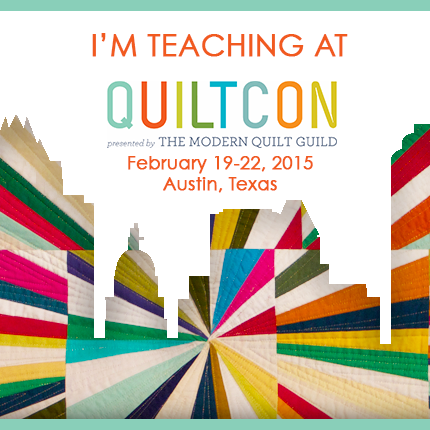 Join me in my New Cathedral Windows workshop at Quiltcon next February!! Check out the schedule here. I'm teaching Thursday, February 19th from 9am to 12pm. Can't wait!! Hey! I'm moving the party from seams likely over to this new address! Click and check out old posts with lots of useful information and some great tutorials about curved bias quilt labels, using shirt fronts to finish the backs of cushions, taming your selvages, and tabletop quilt basting. 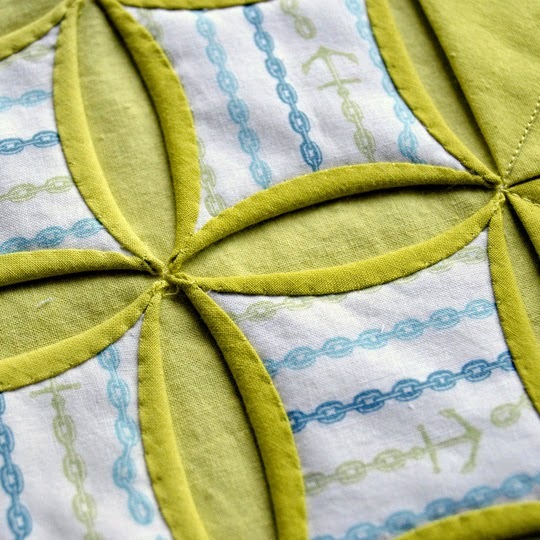 Also a good one about the easiest way to make gorgeous mitered quilt borders. I'll be trying my darnedest to be a better blogger- bear with me while I work out the kinks!